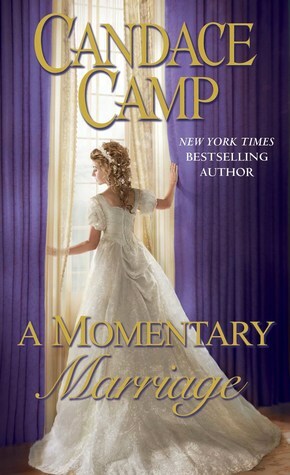 I had fun reading A Momentary Marriage. James de Vere is dying. He knows he's sick and he's tired of fighting whatever is killing him. Yet, as a promise to his cousin Graeme, he decides to seek the help of one last doctor. To his shock, the doctor has passed away and his daughter Laura is in trouble trying to find money to pay his debts. James is a sensible man but in a crazy moment, he proposes marriage to Laura. He knows she needs money and he has plenty to provide her with. He would rather she inherits his land and possessions than his own family. Laura has never forgotten James. He was the man who broke her heart a decade ago when he told her she couldn't marry Graeme. She doesn't like James very much but when he gives her a choice in regards to her future, she takes what he's offering. Laura soon discovers there is more to James sickness than meets the eye. She's determined to save him and without realizing it, she starts having feelings for him. James doesn't seem to be able to stop from caring for Laura. He likes having her around. To his own annoyance, he starts behaving like a man crazy in love. James and Laura were a great pair. Neither was a romantic person but falling in love changes people and both had a hard time maintaining the practical facade when these new feelings were making themselves known.